With the OBi300, you are in control of your digital & analog communications life. Via the OBi300’s on-board telephone connection as well as via the Internet to other OBi endpoints via Obihai’s free OBiTALK network or up to four (4) available SIP-based VoIP services, you have the power make and receive phone calls and faxes as well as bridge mobile, fixed line and Internet telephone services. The OBi300 supports the T.38 fax standard for reliable facsimile calls over the Internet. The OBi300 USB port serves multiple purposes. 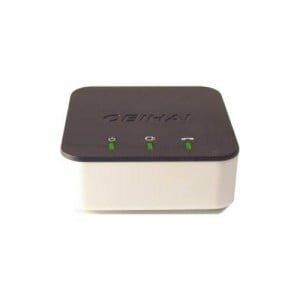 Using the OBiWiFi Wireless Adapter, the OBi300 can be placed anywhere within range of an 802.11b/g/n access point. Or, the USB port can be connected to a storage device to enable local and remote access of stored files over the Internet by authorized users.